The rounded part of the stomach is removed. The remaining stomach looks like a sleeve and holds about 15 percent as much food as the original stomach. This is a good option for those with higher BMI, diabetes, or medical problems like anemia, Chron’s disease, osteoporosis, extensive prior surgeries, and other complex medical conditions. 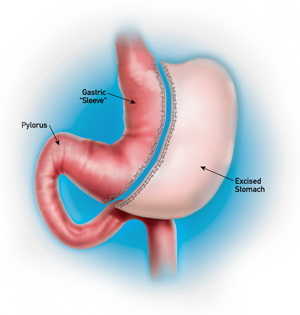 This surgery was originally developed as an initial step prior to gastric bypass. New data shows that many patients achieve a good deal of weight loss with this surgery alone and do not require another bariatric surgery. Expect 1-3 day hospital stay. Return to work in 1-2 weeks.